ALMOST $180,000 was raised for the Cancer Council at the weekend as Gladstone residents donned their onesies, pirate costumes and wigs for the 11th annual Relay For Life. 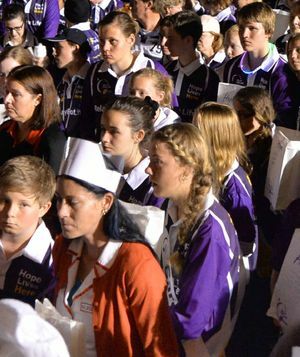 The popular event had approximately 750 people walk, skip and run laps around the Chanel College oval on Saturday and yesterday in support of cancer victims, survivors and carers. More than 60 teams were registered prior to the event and multiple individual registrations were taken on the day. The event is the city's biggest fundraiser. A smile was on every dial, as businesses, families and organisations united, dressed in silly costumes and fuelled by plenty of red frogs and hot chocolates. The survivors' lap kicked off the event and the emotional candle lighting ceremony had not one dry eye in the crowd as participants remembered those who had succumbed to the disease. A moving DVD tribute was played and hundreds of candles lit up the oval as everyone linked arms and did an honorary lap of the field, led by the bag pipes. Rockhampton band Busby Marou volunteered their musical talents, performing for a big crowd before a gig at the Gladstone Entertainment Centre on Saturday evening. An inaugural talent quest drew eight acts to the main stage, replacing the Mixed Relay event. 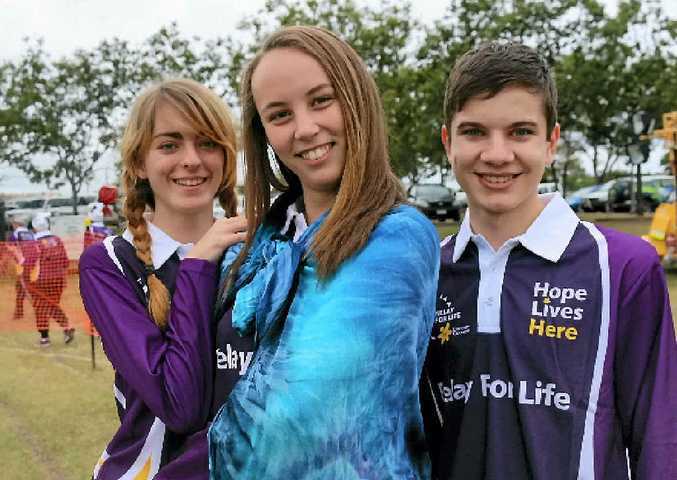 Danae Lowe, Casey Keogh and Steven Cirson from Gladstone State High did laps together at Relay For Life. Alan Symmons, 87, from The Toffee Apples team showed his support by staying for the whole time, even walking at 2.30am. Volunteer marketing and media co-ordinator Hollie Hall said it was efforts like Mr Symmons' that reiterated Gladstone's compassion. "It was Alan's first all-nighter. He was a true champion. "Everyone was inspirational. It just shows the community spirit we have in central Queensland that everyone is willing to lose sleep and get together. "We are a generous town," she said. Geoff Lester and his Gladstone Prostate Cancer Support Group raised $10,700. Mr Lester said it was all about raising awareness and supporting those who are ill.
"We will have $1000 raised before the end of the year for 2015's Relay For Life. "I do it for the wonderful work the group does and to try to raise the profile of prostate cancer," he said. A prostate cancer survivor himself, Mr Lester was celebrating his 10th anniversary in 2014. "I was 49 years old when I was diagnosed. I am doing ok, now," he said. Mr Lester's granddaughters Jenna, 8, and Jordan, 10, dressed up as Smurfs and had a lot of fun. Jacinta Burrows from Powerhouse Tannum Sands dressed up in fluoro exercise gear, held exercise classes and sold healthy treats with her team. She has also been touched by cancer. "Both of my grandparents and my auntie died. My brother is a brain cancer survivor," she said. "It's a good chance to have fun and raise money for a great cause." The Powerhouse crew had racked up $3200 as of Saturday afternoon. Danae Lowe, Casey Keogh and Steven Cirson from Gladstone State High School enjoyed the event. "My sister had a large bone cancer on her hand, she's missing a finger," Steven said. "She just does high-fours now." Gladstone Regional Council's planning department put in a good effort, raising $4500 prior to Relay For Life. The Planner Teers' team members Sarah Camilleri and Helen Robertson baked seven dozen cupcakes with delicate pirate decorations on top.